We’ve got Olympic fever on FUNday! Well, it’s another Monday FUNday post and we’ve got Olympic fever! Although we can’t come close to the thrill of victory in Vancouver, we can sure try with this week’s item! If “Tiniest Alpha Flight Appearances” were an Olympic Sport, this book would win the gold medal. Published in both hardback and paperback by Dorling Kindersley, this book by Catherine Saunders is a 48pg early reading book for kids, featuring the amazing superpowers of various mainstream Marvel Heroes. The actual dimensions of the paperback book are just under nine by six inches, notably smaller than a regular comic. The “Introduction” page includes a reprint of a Marvel poster containing just about every single character in the Marvel Universe and several extremely tiny appearance of Alpha Flight characters. The original image appeared as a banner on top of the official Marvel Universe website, thus the aspect ratio is typical of a banner: extreme from width to height. 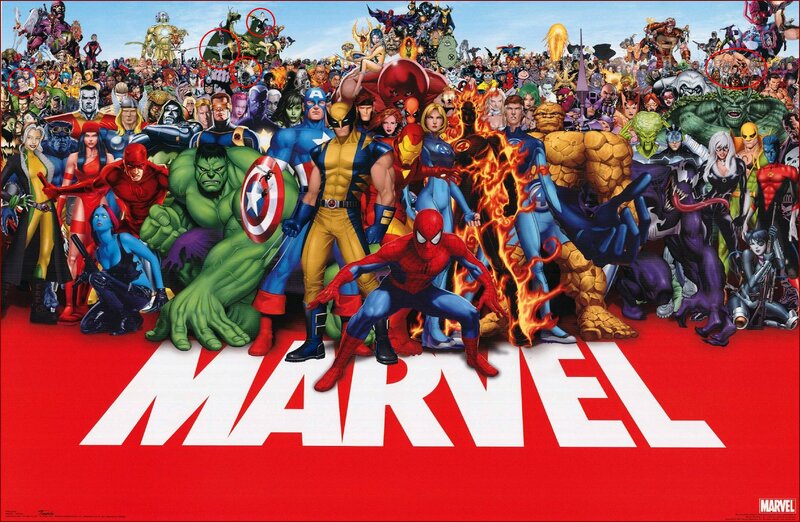 This image became available as a poster-sized print with a red Marvel logo in the foreground and a blue sky behind it and was once available for purchase, though you still needed a magnifying glass to recognize some characters way in the back and some are simply unrecognizable at all. This image is actually a composite of existing character images overlapped on top of each other to create an expansive panorama. Clearly an attempt was made to put the more popular characters in the front and lesser-known characters in the back, but since its debut, popularity has shifted around, so the image dates itself in a subtle way for sophisticated fans who track the ups and downs of characters. It’s difficult to show the actual image from the book because the image of the poster was greatly reduced to a 2pg spread (appx 10 inches wide) while the original poster was 36 inches. Instead, here are portions of the poster itself. Unfortunately, characters near the back are very, very tiny so I’ve highlighted the Alphans in red. Aurora can be seen on the extreme left side, just behind Sandman and above the foreground image of Rogue. Snowbird and Northstar can be see in flight just in front of Fin Fang Foom and above the foreground image of The Hulk. Guardian can also be seen in the scrum just behind Dazzler. On the far right, the volume 3 team can be seen, from left to right: Major Mapleleaf Jr, Puck (Zuzha), Yukon Jack, Nemesis, Centennial and Sasquatch behind them all. They are just below Galactus and above the foreground image of Iron Fist. So if you don’t know how to read, go get this item for your collection, use it to learn how to read, and then come on back here to read all about it on FUNday!